Bradford Woods Borough. Billboard for “Sterling Gasoline…You will notice the difference,” two story Graham residence on Wexford Run Road in center of photo. Photo taken January 28, 1927. 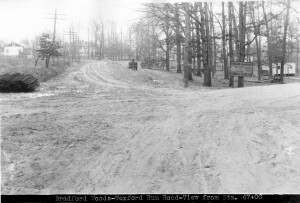 Bradford Woods, originally settled as a summer getaway, was incorporated as a borough on May 3, 1915, from Marshall Township. The Pittsburgh, Harmony, Butler and New Castle (Harmony Line) interurban railway previously ran through Bradford Woods, where Forest Road is today. It provided a direct route to Pittsburgh, PA. A home rule government was established in 1974. Do you have any Bradford Woods “treasures” in your attic, closet or shoe box? Learn how to contribute to the permanent Bradford Woods archive.